Foster collaboration in your organization by giving your co-workers an at-a-glance status of your whereabouts and availability with Lync Online. Share what you’re up to by entering text in the Personal Note section. You can enter text and hyperlinks in this section and your entries are displayed in the Activity Feeds, which provide real-time status of shared information within your organization. 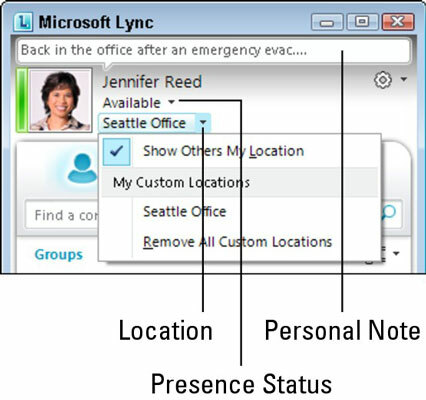 Lync automatically displays your presence status based on your activity or Outlook calendar. Your location displays information based on the network to which you are connected. Make your location meaningful by giving it a more descriptive name (Home, Office, or Work). You can create a custom location simply by typing into the Location bar and pressing Enter.